The Battery on the Waterway is a gated community located in Carolina Forest on Myrtle Beach’s Intracoastal Waterway. This exclusive and upscale community has 99 lots and is a unique Charleston-style neighborhood. With architecture reminiscent of the Charleston Battery, an historic landmark civil-war defensive seawall and promenade overlooking Fort Sumter and Charleston Harbor, the Battery on the Waterway in the Carolina Forest community of Myrtle Beach is one of the Grand Strand’s most exclusive and distinctive subdivisions. 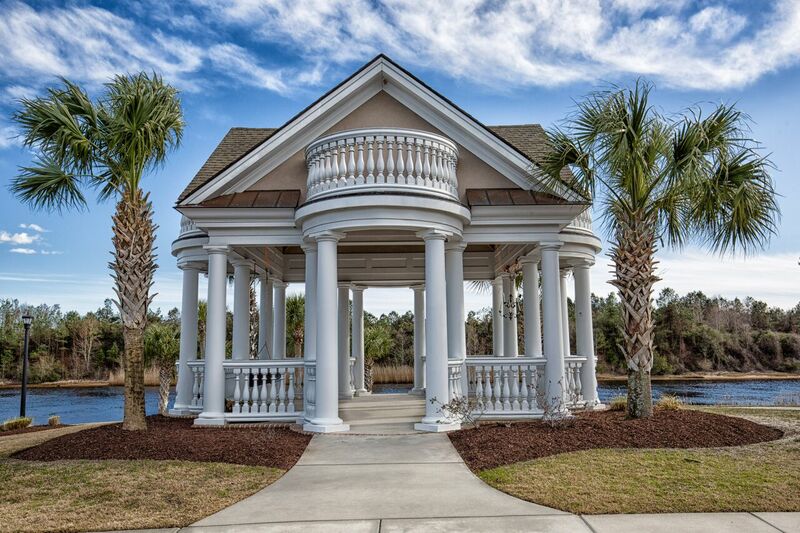 Born of the antebellum style of the classic and fashionable Charleston homes and nestled on the beautiful Intracoastal Waterway in Myrtle Beach, The Battery on the Waterway in Carolina Forest is a gated community with large lots. The Battery on the Waterway offers waterfront properties where luxury homes and lantern lined streets reflect the Charleston Battery’s history and charm. Homes for sale in The Battery on the Waterway have full access to the waterway by means of the community boat launch ramp and day dock. Boat storage is also available onsite. The Battery on the Waterway community on the Intracoastal Waterway is near SC Hwy 31, Grissom Parkway and Hwy 17 Bypass, all of which provide easy access to highly-rated medical facilities, entertainment for the whole family, and of course easy access to the Myrtle Beach Airport and the number one Grand Strand attraction, sixty miles of beautiful beaches – the perfect location for a permanent home or a vacation home. Most of the waterfront homes are elegant three story mansions, some with theatre rooms, private pools, elevators, and multiple fireplaces. Because these amazing homes offer so much, they sell for asking price and sometimes more. They are never long on the market. The Battery on the Waterway in Carolina Forest is rich with elegance and offers a peaceful, comfortable and exclusive lifestyle. Yet the Battery homes are still reasonably priced compared to many comparable neighborhoods. Every home shares an Intracoastal Waterway view and every four waterfront estates share a four-slip boat dock. A second row of home sites backup to and overlook a lake for fishing, kayaking, and nature-watching. A biking/walking trail is just outside the gates and leads to a bridge to the beach. The Battery on the Waterway is a relatively new subdivision with the first homes built around 2012, but there are newer homes, some currently under construction. And there are lots – both waterfront and waterview – with no required groundbreaking time frame and no required builders. Homes range from around $600,000 to $900,000 on the water, and as low as $300,000 for second row/water-view homes. Lots start at around $160,000. The Battery on the Waterway offers beautifully landscaped gated entrance and common areas. The Battery on the Waterway is located within Carolina Forest, Myrtle Beach and is minutes from award winning schools, shopping, fine dining and the new Town Center. Visit this community’s web page at The Battery on the Waterway. Discover the definition of luxury. Whether homebuyers are interested in a truly special existing home or want to explore the adventure of building a custom home from the ground up, The Trembley Group Real Estate Sales Professionals offer the expertise and tours of one of the most exclusive neighborhoods in Carolina Forest. They have the experience to help their clients find their dream home today!